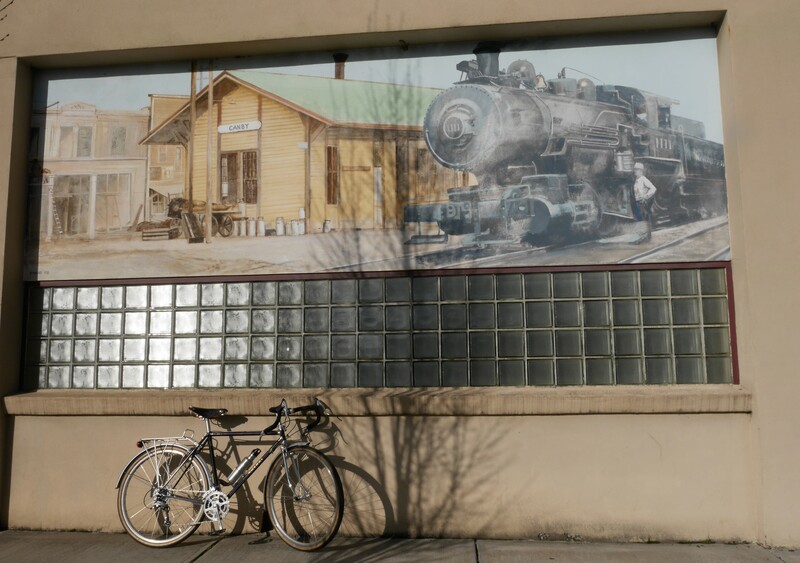 If you are looking for a peaceful, nature-filled cycling adventure, look no further than Canby, Oregon. The site of this little town was once a gathering place for Native Americans who enjoyed the local crop of strawberries and used the area as a meeting place. 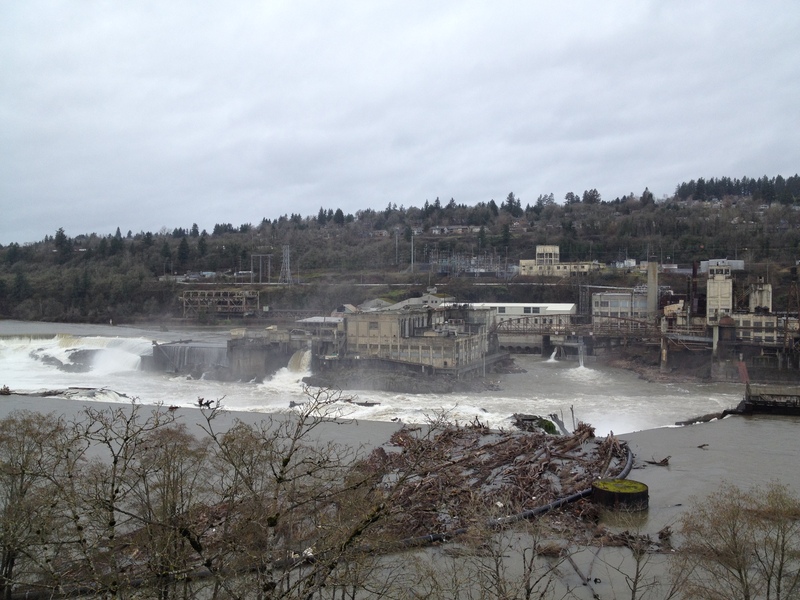 Canby sits on a plateau above the east bank of the Willamette River. 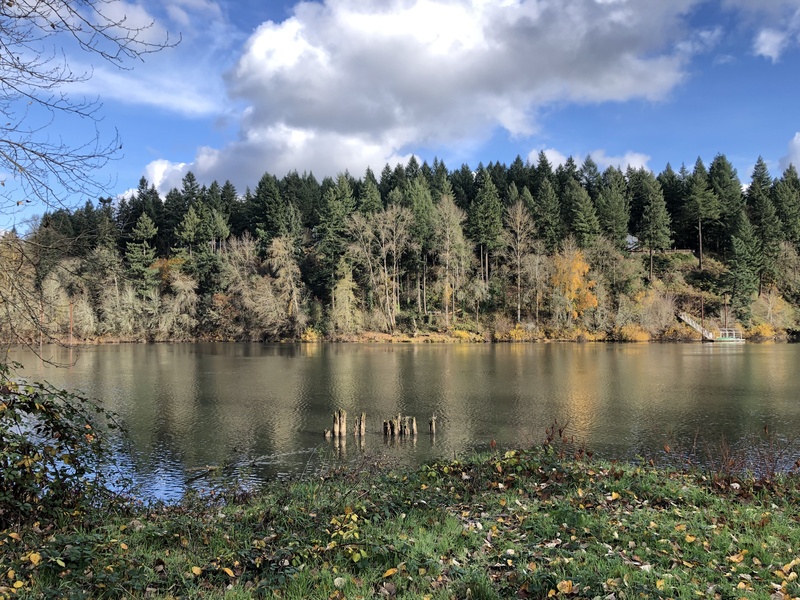 The Canby Ferry, on the outskirts of the town, is one of those rare cable ferries, and will take you across the river on a tiny conveyance whose maximum load allows for 6 cars and 49 passengers, plus a bicycle or two. 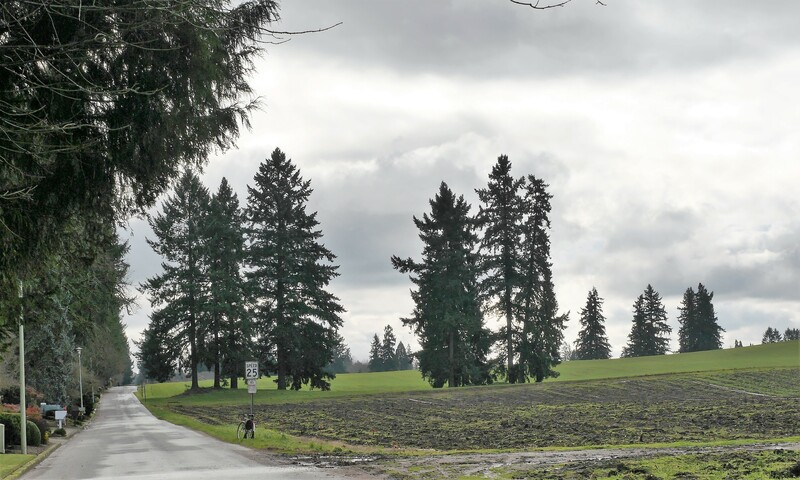 Cycling around Canby is mostly flat, but if you venture out east of Highway 99E you will begin to climb up to another plateau that sits at the base of the Cascade Mountain Range. 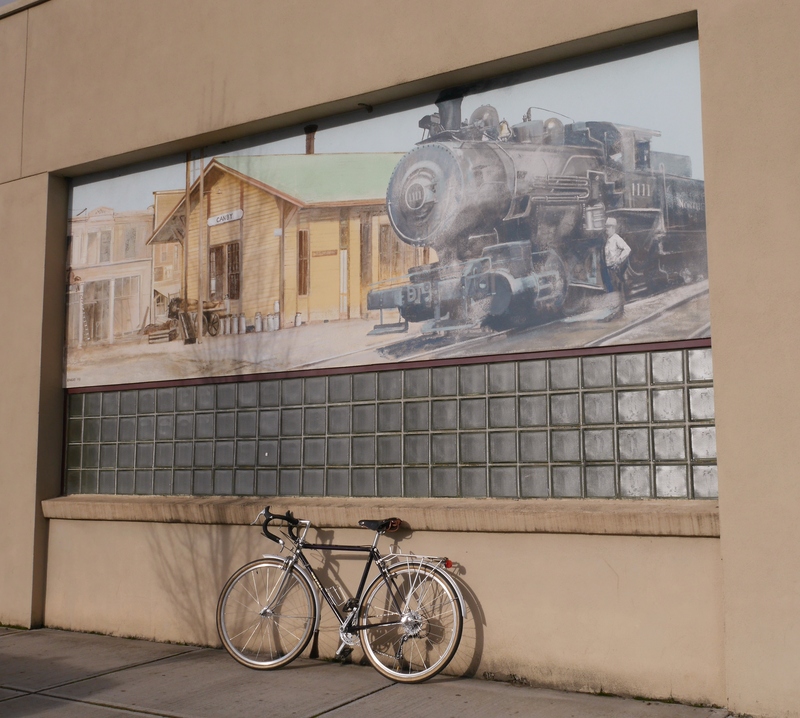 For today’s ride, I stayed close to town, and was able to use mostly my highest gears. In fact, as I was blasting away in my top gear I thought: Uh oh! What will it be like on the return trip? As it turned out, I seemed to have a slightly downhill grade the whole way, and enjoyed spinning leisurely on my Meral. Many of the town’s back roads have 25 mph speed limits. I kind of worried about exceeding them! 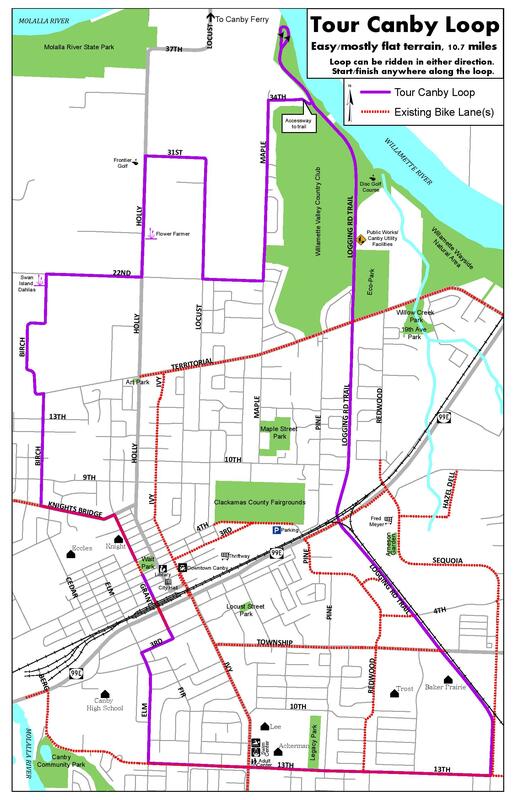 The town’s website has several bike route maps which you can download. I printed out all of them for my trip today, but actually ended up just riding where my instincts took me. One route not to be missed is the Logging Road Trail which leads down to the river. 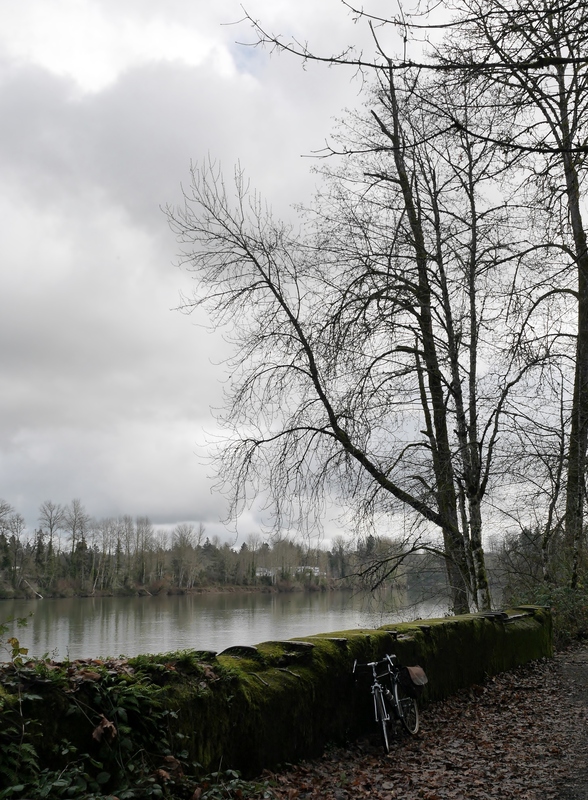 I took an inviting unmarked path off this trail and ended up at the banks of the Willamette River, after walking the bike through a very muddy section. 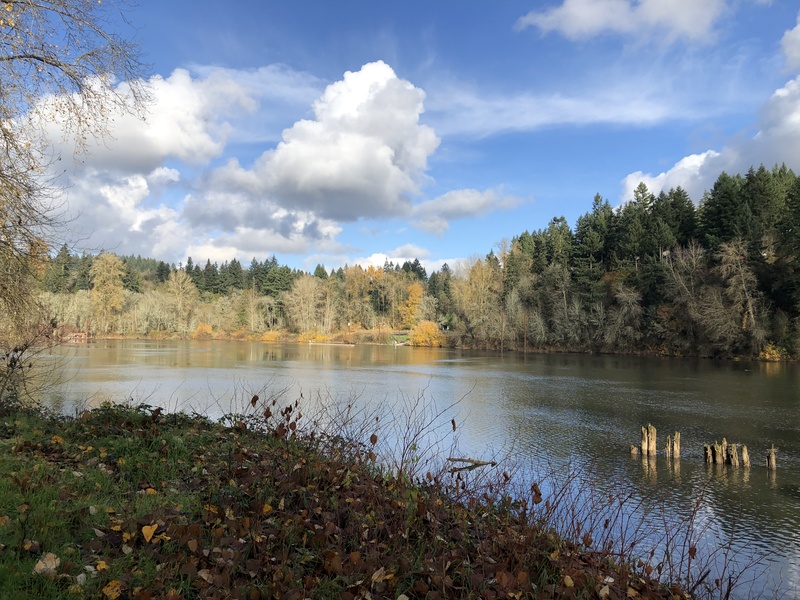 I was rewarded with a lovely view of the river, quietly meandering northward toward Portland. 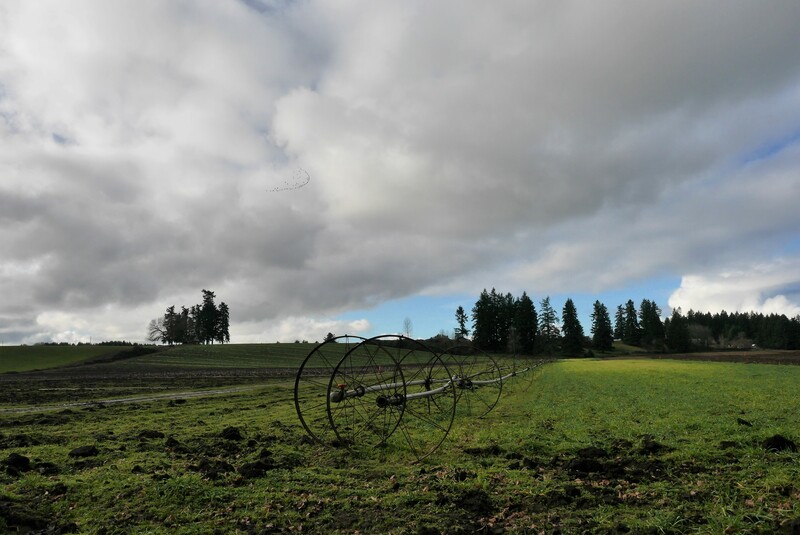 On the way back, I encountered lovely pastures, crop fields at rest, and big horizons. Seeing these irrigation wheels reminded me of my childhood. My grandfather was an enthusiast of this “new” technology back in the 1950’s. Wheel line irrigation is in use today, but was developed many decades earlier. If you have the opportunity to cycle here, I think you will be delighted by the roads, friendly residents, and the enticing call of the wild. 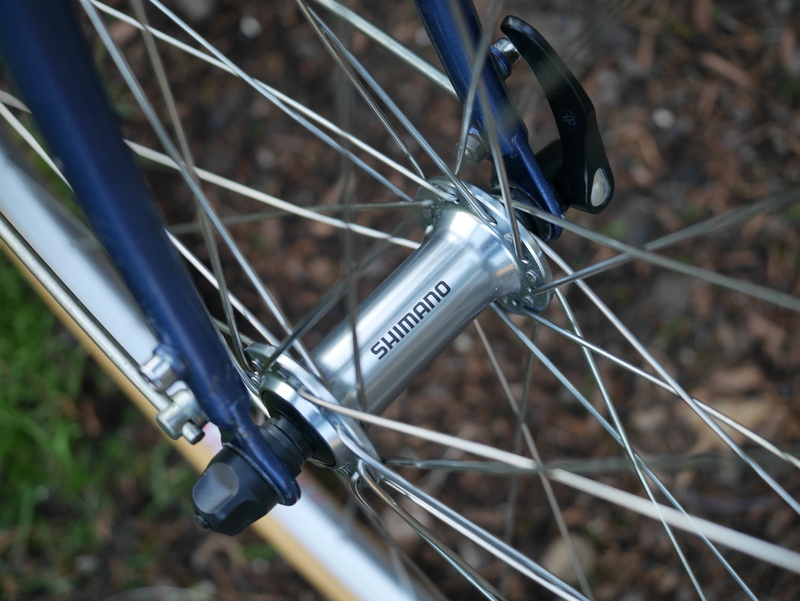 Bicycles with 650B wheels are nicely suited to a relaxed riding style. 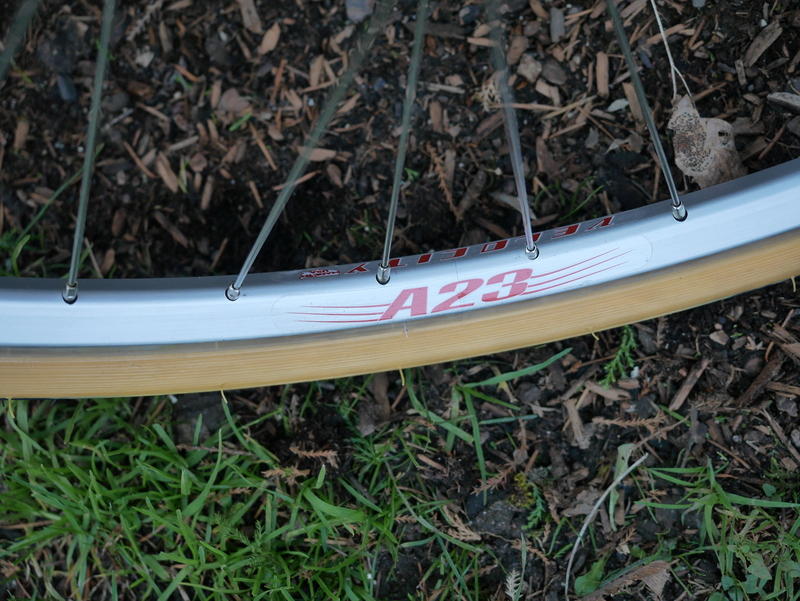 The wider rims and greater clearances on the bike’s frame allow for plump, comfortable tires. 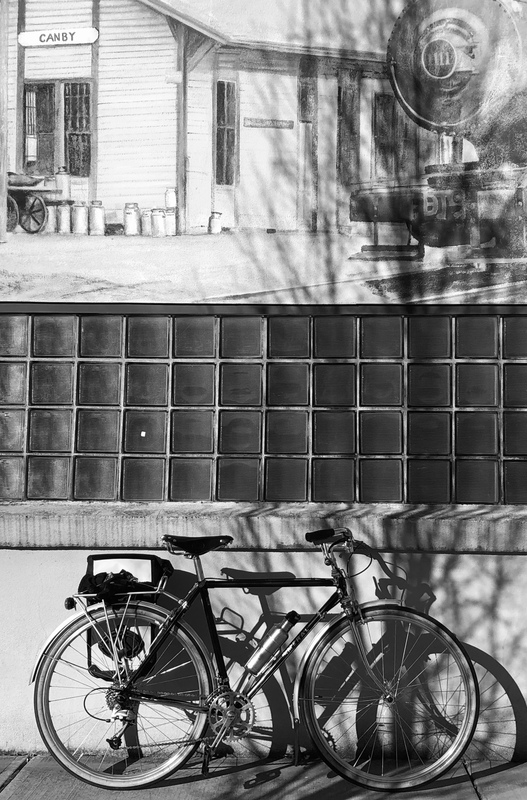 Often, vintage 650B bicycles are set up as city style bikes, with minimal gears and an upright position for the cyclist. My recently acquired early 1980’s Meral randonneuse cried out for a 650B conversion. 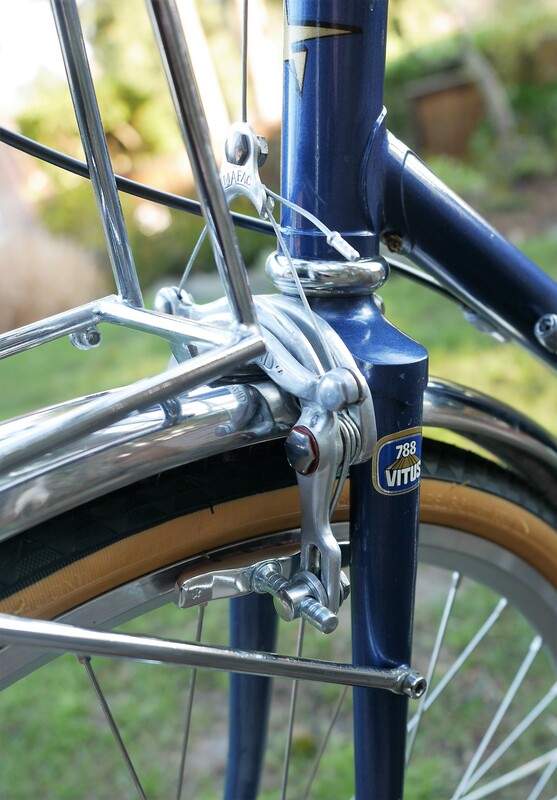 It was built with Vitus 788 tubing around a set of narrow, 700c rims. 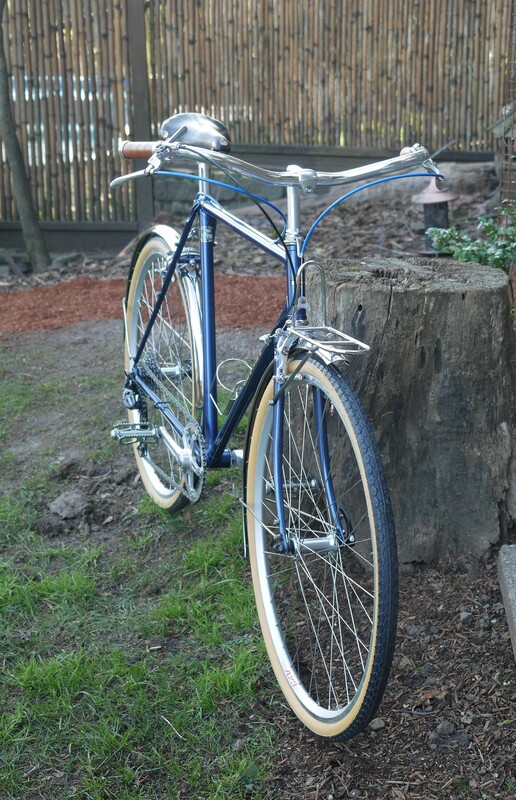 The bike as originally configured had a high bottom bracket and minimal tire clearances. These elements would normally indicate an ideal bicycle for a 650B conversion. 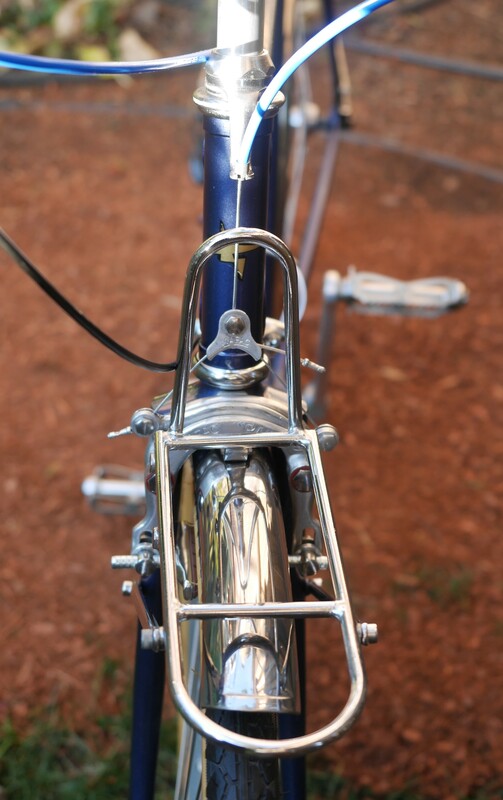 Still, I wasn’t sure if I would be successful converting the bike, because the brake clearances were odd – with the front brake having less reach than the rear brake. 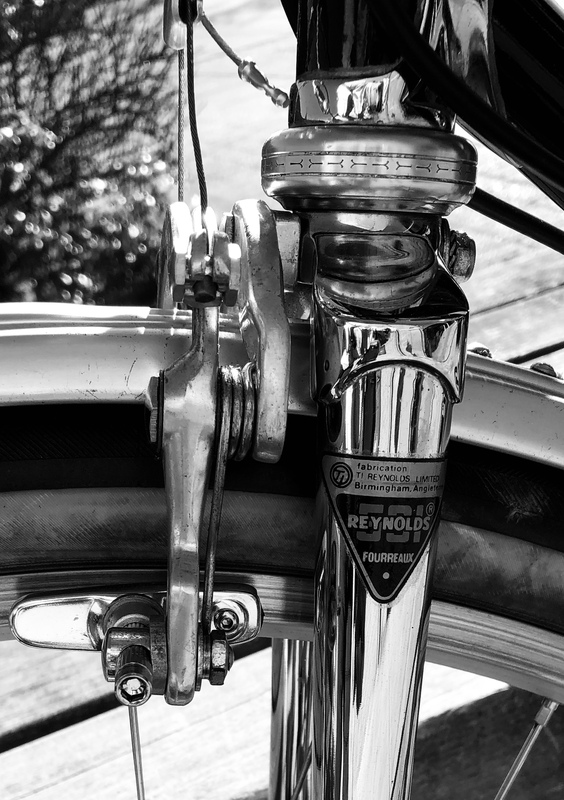 In times past, competitive oriented bicycles were sometimes built with more brake reach in the rear than the front, and that was so that a shorter reach and therefore stronger brake could be used at the front end. 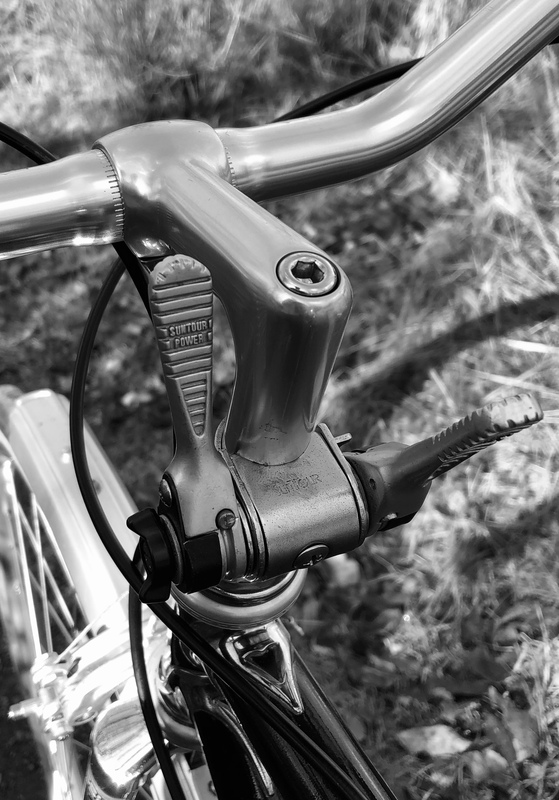 The rear brake reach on this bike is greater than the front by more than several millimeters. When it came time to install the Mafac Raid long reach brakes, this fact made me concerned. In order to have the rear Mafac Raid brake pads contact the new 650B rim, I needed to angle them down slightly, which is not ideal. There are other options for dealing with brake reach problems, including installing brackets (a la Sheldon), and filing some material off of the caliper arms, to allow the brake pads to sit a bit lower. None of those options appealed to me. 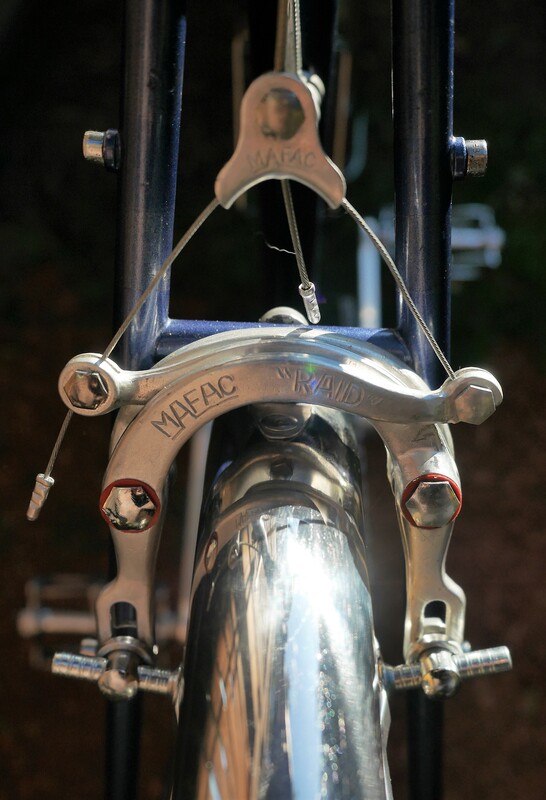 Vintage Mafac Raid brake calipers with V-O squeal free pads. Meral custom steel rack, with mounts for front flashlight. 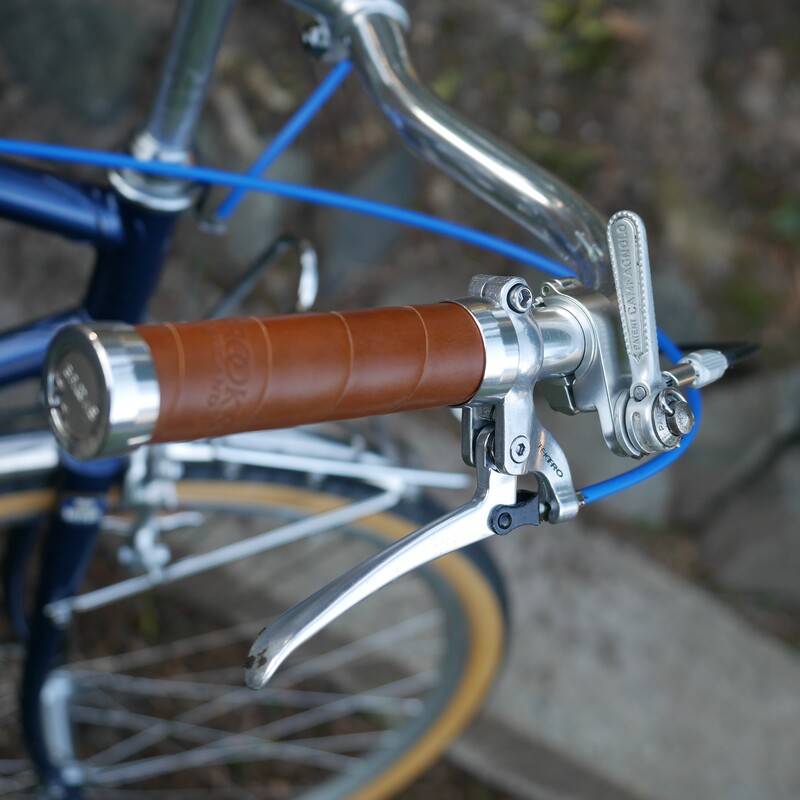 This project was loads of fun, thanks to the beauty and quality of this vintage Meral bicycle. The custom fenders and rack were a perfect match to its new Town and Country personality. V-O’s thumbies worked well for this build – they can be used with just about any type of shifter so are more adaptable than their Paul’s competitor. I used a lower end 650B wheelset that I will not purchase again, and I consider the wheels as a placeholder for now. Probably I will build the ideal wheelset for this bike when the time comes, and will sort out the lighting options at that time. 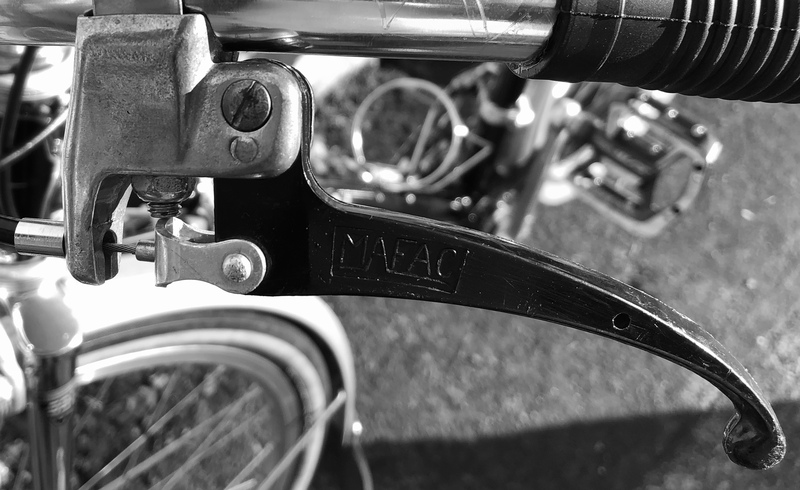 Meanwhile, I hope you enjoy these photos of this amazing vintage bicycle which now has a new lease on life. I have included the specs and full build list at the bottom of this post. 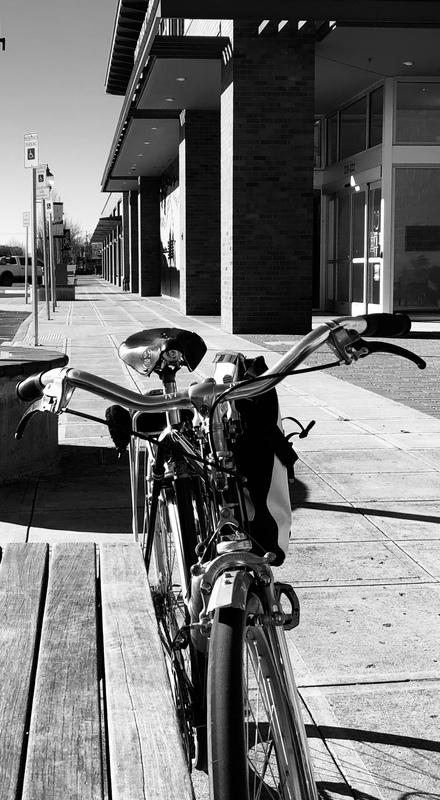 A view from the back – with a tiny vintage reflector installed on the custom fenders. 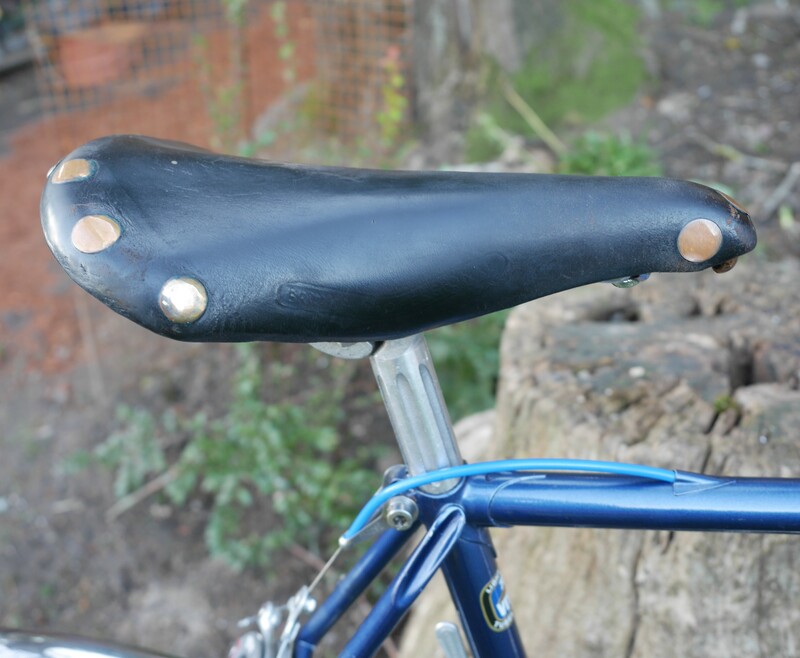 Original Brooks Pro saddle. Through the frame brake cable routing for the rear brake. 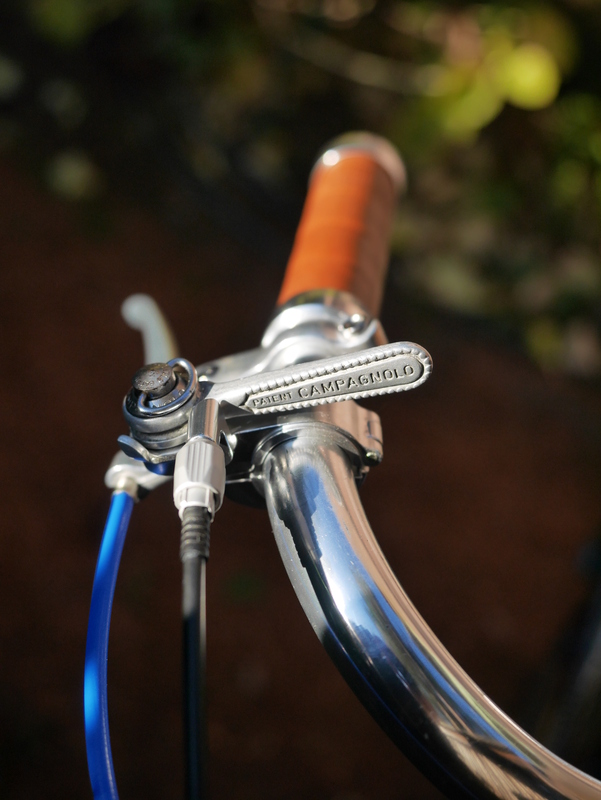 Campagnolo shifter on the seat tube braze on – intended for a BB mounted dynamo. Nicely executed seat cluster. 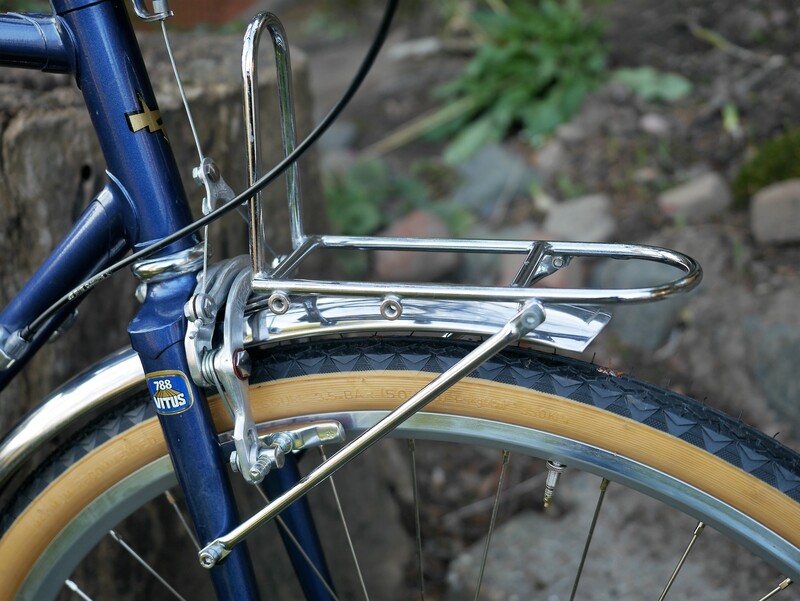 This gorgeous custom Meral steel rack can also be installed at the rear of the bike. 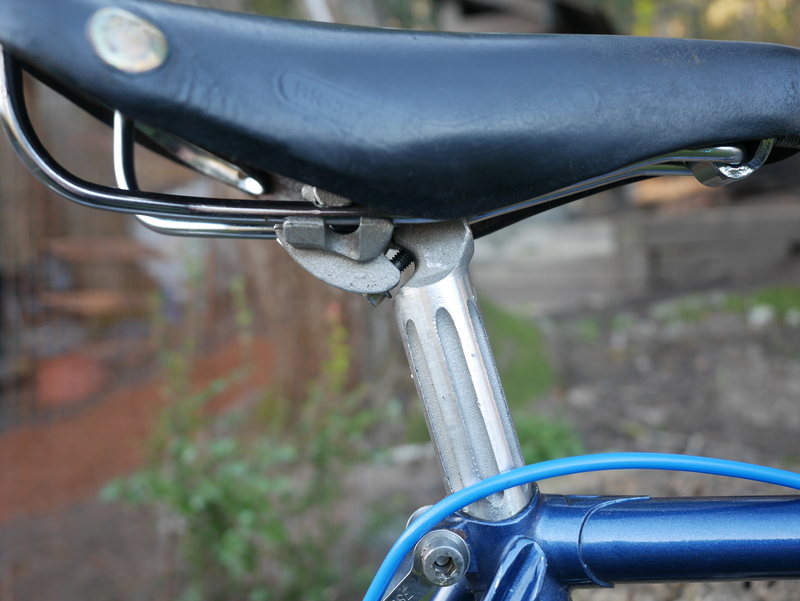 Unusual JP Routens slanted seatpost clamp – allows for micro adjustment of the horizontal angle of the saddle. The drive train is a single 42 tooth drilled ring up front, with a 7 speed cassette at the back, controlled with a vintage friction Campy shifter. 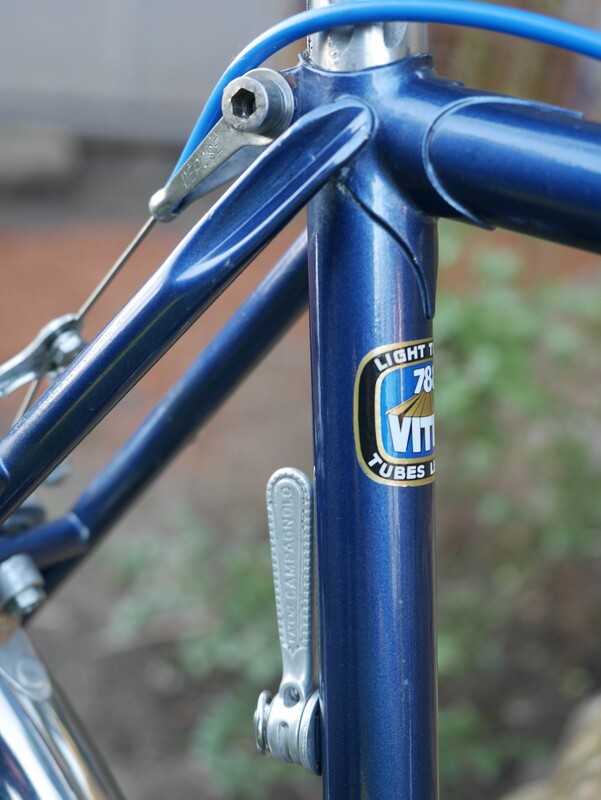 Frame and fork: Early 1980’s Meral with Vitus 788 steel tubing, 54 cm ST, 56 cm TT, through the frame brake and dynamo wiring, 2 rack mounts on the seat stays, 2 rack mounts on the fork, bottle cage mount, shifter braze-ons, ST dynamo braze-on, 127 rear spacing. Drive Train: Vintage Sugino crankarms and Sugino drilled 42T ring; new 7 speed cassette, vintage Lyotard pedals, Shimano SLX rear derailleur, original T.A. bottom bracket, replacement T.A. spindle of shorter length, V-O thumbie with vintage Campagnolo friction shifter. Braking: Vintage Mafac Raid long reach centerpull brakes, new V-O smooth post pads, new Tektro vintage style levers, new blue color matched housing. Wheelset & Tires: New 650b wheelset: Shimano Tiagra hubs on Velocity A23 rims (purchased from Harris), tires and wheelset are placeholders for now. 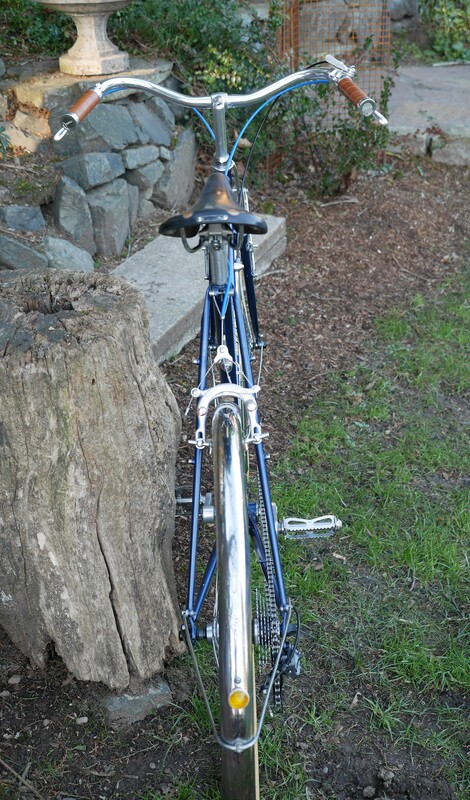 Saddle and Seatpost: Original Brooks Professional saddle, original JP Routens slanted seatpost clamp. Bars, stem and headset: new Soma Oxford handlebars and Nitto Technomic stem (sanded to French 22.0 steerer size), original French Stronglight headset. 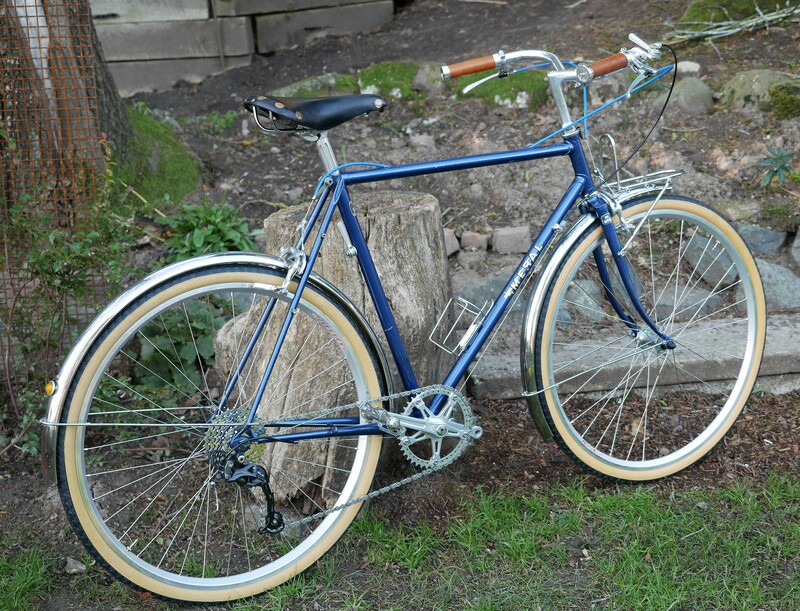 Accessories: Original Meral custom steel fenders, original Meral custom steel front rack, new V-O bottle cage. Ready for a leisurely ride wherever you want to go.